- Pound-to-Canadian Dollar exchange rate to end year lower. - Economy and Bank of Canada surprise to support CAD in second half. - NAFTA negotiations to remain a key near-term risk. - Don't discount importance of oil prices for the Canadian Dollar. The Canadian Dollar was the best-performing major currency at the start of the mid-week session following reports the US has dropped a demand in the NAFTA talks that all vehicles made in Canada (and Mexico) for export to the US contain at least 50% US content. The message is not so much in the specifics, but rather in the fact the US administration is showing flexibility, which augers for a positive outcome to the renegotiations of NAFTA. "Motor vehicles and parts account for some 21% of Canadian exports to the US, not far below energy, which is 25%, so this is a big win for Canada. CAD has been the worst-performing major currency so far this year; if there starts to be some optimism about NAFTA talks, there could be a serious rebound," says Marshall Gittler, an analyst with ACLS Global. 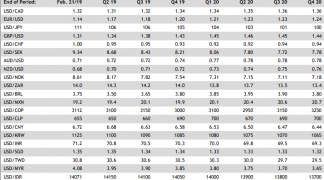 "The CAD should react very positively if talks end in a new trade agreement, which they might well do before the summer," adds Richard Falkenhäll, a senior FX strategist at Skandinaviska Enskilda Banken (SEB) - one of Europe's top lenders by market capitalization. And it's not just trade talks that appear to be going the Loonie's way as it the currency has also been boosted by a sharp rise in oil prices, which serves as a reminder of the commodity's importance to the Canadian economy. 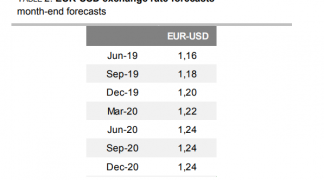 These developmets support recent arguments by analysts at SEB suggesting the headwinds that have blown the currency lower in recent months could soon start to recede. SEB forecast the Canadian Dollar will stage a strong recovery against the US Dollar and other currencies later in 2018 but caution that, in the short term, it remains vulnerable. "While in our view fundamentals and monetary policy justify a stronger CAD, we accept that uncertainties surrounding both the outcome to present NAFTA talks and the outlook for the housing market, as well as low expectations regarding further BOC rate hikes will all help ensure a continued weak currency," says Falkenhäll. Canada's Dollar has fallen to a nine month low against the US greenback so far in 2018, and plumbed the depths of a two year trough against Sterling, as markets responded to a deterioration in the Canadian interest rate outlook and mounting concerns over its international trading relationships. Above: USD/CAD rate shown at weekly intervals. The USD/CAD rate has risen nearly 4% in the year to date, to trade at a nine month high of 1.3124 in March. Meanwhile, the Pound-to-Canadian-Dollar rate has moved up to a 21 month high of 1.8410 in recent weeks. 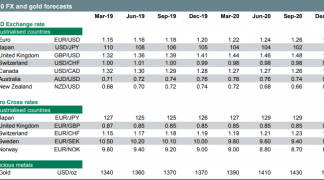 "Despite another rate hike by the Bank of Canada (BOC)in January (the 3rd since July 2017), the Canadian dollar has substantially underperformed other commodity currencies this year. As the Canadian economy did well in 2017 with GDP growing by 2.9%, fundamentals can hardly be blamed for the CAD’s weak performance," Falkenhall writes, in a note Tuesday. A so-far fruitless attempt to renegotiate the NAFTA pact with Mexico and the US, at the behest of President Donald Trump, has been a key source of downward pressure on the Loonie in 2018. President Trump once described the accord as "the worst deal in history" while out on the campaign trail and pledged to withdraw from it if more palatable terms cannot be agreed. "While it currently appears as if Canada will escape new US tariffs on steel and aluminium, at least for now, fears surrounding the possible outcome of NAFTA talks and the willingness of the US President to continue discussions appear to explain why the loonie is currently weak," Falkenhall adds. Concerns about NAFTA, and the Trump administration's attitude toward free trade, have been reinforced by the emerging threat of a global trade war. This hit the wires when the White House announced new levies on imports of aluminium and steel earlier in March. Both Canada and Mexico have been exempted from the metal tariffs while China and the European Union have pledged a response if they too are not also excused. It has since been reported the White House is now mulling tariffs on Chinese telecommunications and technology goods. President Trump recently urged negotiators to reach a prompt agreement on NAFTA, in light of the looming Mexican Presidential election in July and US midterms in November, as talks will have to be postponed until both have passsed if a deal cannot be reached during the eighth round of talks in April. "Most likely the eventual outcome of such talks will significantly impact the Canadian Dollar going forward. If discussions were to break down or President Trump decided to withdraw from the current free-trade agreement, it would most likely represent a major setback for the Canadian Dollar," says Falkenhall. The trade headwinds that rocked the Canadian Dollar through the early stage of 2018 are expected fade over the coming months, enabling markets to refocus on Canada’s solid fundamentals. "If there is a new deal that differs only slightly from the current trade agreement, it would probably trigger significant appreciation by the Canadian Dollar," Falkenhall notes. This will see monetary policy and oil prices reclaim their position as dominant drivers of Canadian Dollar exchange rates and is why the SEB team are forecasting a rebound for the Loonie in the second half of the year. The Canadian Dollar has long tracked movements in the price of crude oil, given the commodity is Canada’s largest single export. This relationship has broken down of late, either because the Loonie has been weighed down by trade risks or markets were simply sceptical of whether oil prices could maintain their recent momentum. However, the SEB team say the correlation between the two should pick back up again soon, which could lead to a sharp adjustment higher for the currency. Above: SEB graph showing relationship between oil prices and USD/CAD. In addition to the rise in oil prices, the Canadian Dollar is also expected to draw more support from a robust economy and hopes of further interest rate rises in the months ahead. SEB cite continued above-trend economic growth over the course of 2018 which - when combined with unemployment at its lowest level since October 2007 at 5.8% - should add upward pressure on wage packets as grounds for thinking the Bank of Canada will still raise interest rates again this year. Falkenhall notes that markets price only one more rate increase from the BoC this year, despite that most (though not all) analysts are forecasting two rate hikes that will take the Canadian cash rate up to 1.75%. This means there could be scope for market market pricing to converge with analyst forecasts in the months ahead, which would be positive for the Loonie. The SEB team itself predicts the BOC will follow the Federal Reserve this year, which suggests a total of three more rate rises in 2018, which would take the overnight up to 2% at year end. This would be even more bullish for the Canadian Dollar. "If this forecast proves correct, such a move should support the Canadian Dollar in H2 this year," says Falkenhäll. SEB forecast that, despite price action in recent months, the USD/CAD rate will fall to 1.20 before year end as a NAFTA deal is wrapped up and risks to the Canadian economy recede. This implies a rise in the value of the Canadian Dollar of some 7.6% in the months ahead. 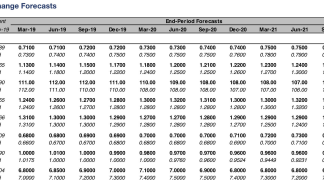 SEB also forecast the Pound-to-Canadian-Dollar exchange rate will ease lower from 1.8329 to 1.81 level before year end.